If you are seeing Doris for the first time, she will first have you fill out a new client information form that includes a few simple questions, along with your name, address, etc. She will spend a few minutes explaining what to expect duing and after your session and answer any questions or concerns you may have. Energy Medicine is based on the belief that everyone has a "life force", and that the body needs to sustain balance for optimum health. Anytime you experience emotional or physical illness, it indicates that your life force has simply become unbalanced. Doris works directly with your energy field to restore balance and flow to your entire system. And once your energy field has been restored to full health, your body will follow. 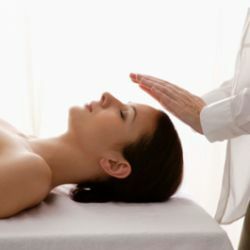 Reiki is a Japanese form of energy work that cleanses and balances the energy system in the body. As a result, the body's natural self-healing mechanisms strengthen, helping to establish optimum health. During a session, Doris works directly with your energy field to remove blockages, detoxify your system, and restore your vital life force energy. 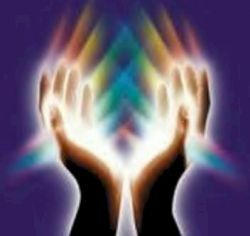 Reiki utilizes a gentle laying on of hands to conduct the necessary energy force between us. The benefits of Reiki range from the release of habitual mental/emotional stress to alleviating chronic pain. Acupressure is based on one the most ancient principles of healing - that simply touching a specific point on the body will release stress and improve health in the body. In an acupressure session, Doris applies firm pressure directly to these "points" on your body, which relieves your muscle tension and improves your circulation. This simple and powerful technique has been shown to very effective in treating headaches, backaches, and even insomnia. 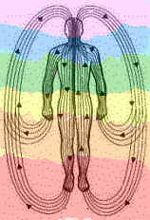 Polarity therapy is a type of bodywork which is focused on the energy fields of the body, rather than the physical body itself. This type of body work is also called energy work, because the practitioner attempts to adjust the skewed energy fields of the body and bring them into balance. Crystals have a long tradition of being used for crystal healing. Each variety of crystal has a unique internal structure, which causes it to resonate at a certain frequency. It is this resonance that is said to give crystals their healing abilities. Applying this resonance in a coherent way can help to restore stability and balance to the bodies energy systems, stimulating the body's natural healing mechanisms. Crystal therapy is a gentle non-invasive form of alternative healing that works holistically to harmonize the mind, body, emotions and spirit, helping to increase our feeling of well-being, neutralize negativity, lift depression and to help us to become integrated, whole beings. This technique may be included in your Energy Medicine/Reiki session, at no extra charge, based on individual needs and wishes. Chromotherapy is a holistic therapy that focuses on restoring health by correcting the body's color imbalances. 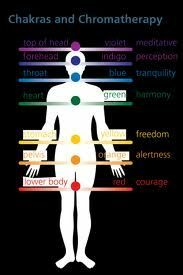 Chromotherapy treatment, including chakra balancing, can be used alone or to complement other spa therapies. Color-based therapy aims to restore the balance of the body's electrical and magnetic fields, addressing illness at its core. While it sounds too simple to be true, chromotherapy has been scientifically proven to offer health benefits. Hydrotherapy is a health treatment that utilizes water to deal with various types of ailments and their associated aches and pains. In some cases, the therapy involves the use of hot water, while cold water is helpful in other situations. This type of water therapy may involve strategies that include immersing the patient in water or combining the water with oils and herbs as part of the treatment process. Doris uses warm, moist towels or ice packs. Aromatherapy is the practice of using the natural oils extracted from flowers, bark, stems, leaves, roots or other parts of a plant to enhance psychological and physical well-being. The inhaled aroma from these "essential" oils is widely believed to stimulate brain function. Essential oils can also be absorbed through the skin, where they travel through the bloodstream and can promote whole-body healing. A form of alternative medicine, aromatherapy is gaining momentum. It is used for a variety of applications, including pain relief, mood enhancement and increased cognitive function. There are a wide number of essential oils available, each with it's own healing properties. Doris uses only DoTerra certified therapeutic grade oils and each session is customized based on the clients needs. 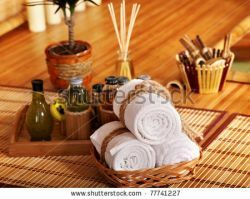 All sessions include aromathery, at no extra charge, unless declined by the client. dōERRA’s AromaTouch Technique is a clinical approach to applying essential oils along energy meridians and visceral contact points of the back and feet to help balance sympathetic and parasympathetic nervous systems of the body. 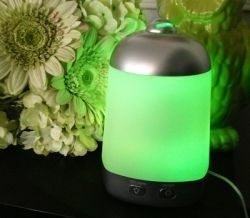 Developed by Dr. David Hill, a leading expert in integrative medicine and therapeutic applications of essential oils, the AromaTouch Technique improves wellbeing by reducing physical and emotional stressors and by supporting healthy autonomic function. The technique is simple and intuitive and uses dōERRA’s CPTG Certified Pure Therapeutic Grade™essential oils for an unparalleled grounding experience for recipients. There’s nothing worse than experiencing ear pain or sinus headaches where you can’t work, think or sleep. Today, more and more are seeking alternatives to digging in the ears with Q-tips or using a hydrogen peroxide flush to clear blockages in the ear canal. 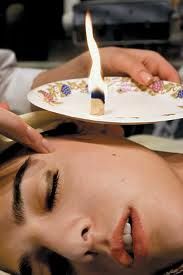 Ear Candling is a natural and non-intrusive alternative that may help alleviate the painful effects of chronic headaches or sinus conditions, ear infections, minor hearing loss due to excessive ear wax buildup, allergies or vertigo. You should not have ear candling performed if you have any damage to the eardrum, ear tubes, congenital hearing loss, ankylosis of the stapes, acute mastoiditis, or recent surgical procedures to the ear. While many find ear candling to be an effective procedure, everyone is different and we can't guarantee results. You may, for a short time, feel a bit of pressure in your ears following a session. This is normal. We recommend you not fly or get fluid in your ears for 24 hours after your treatment.